Eating out at local restaurants has become more common with everyone’s busy schedules, and local Port Aransas organizations are striving to make dining out a less “disposable” experience. 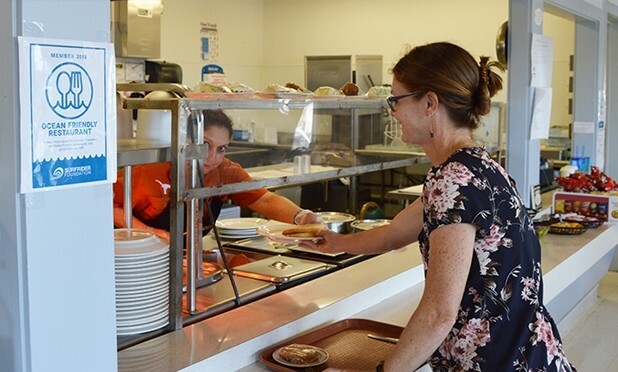 In early June, the cafeteria at The University of Texas Marine Science Institute (UTMSI) in Port Aransas, Texas joined five ocean friendly restaurants in the Coastal Bend area and has committed to reducing deposable waste options. The effort is organized by the Surfrider Foundation and its chapters across the nation are encouraging restaurants to join the Ocean Friendly Restaurant (OFR) program and minimize their disposable waste practices. Whether this refers to plastic straws, to-go containers, or plastic bags, the accumulation of disposable packaging is affecting animals that live in the ocean and people that recreate in the ocean, beaches and bays. “The goal of this effort is to reduce single-use waste one restaurant and one customer at a time,” said Christie Irps, Surfrider Ocean Friendly Restaurant Coordinator of the Coastal Bend Surfrider Chapter. The cafeteria at UTMSI pledges to meet an ocean friendly standard and follow four requirements. No expanded polystyrene foam is used, proper recycling practices are followed, only reusable tableware is used in the dining facility, and no plastic bags are available for eat in or take out needs. The UTMSI cafeteria has reusable beverage cups that can be purchased and used for future visits. The OFR program and the supporting restaurants have the potential to positively impact the waterways by reducing single use plastics and reducing litter on our beaches.